Quadratics Project - The DP of Fernando R.
In this project we started by using a quadratic equation to solve a real life situation of a rockets trajectory. At first we didn’t know what a quadratic was so we were a bit confused about how there would be a maximum height and how it was modeled by an equation. This started our exploration into what quadratic equations were and how squared terms could be incorporated into equations to add a new dimension to graphing. We learned how to convert from vertex to standard form and vice versa. We also learned about how factored form ties into each form and what each form could be used for. Vertex form, as the name implies, can give you the coordinates of the vertex of a parabola, factored form can be solved to give you the x intercepts and with standard form, you can solve for the y intercept by setting x equal to 0. For our postcard activity we got to explore how quadratics and parabolas occur in real life. Some found the parabolas of physical objects like skulls or the curvature of seals, others found parabolas in trajectories of dives or balls being thrown. 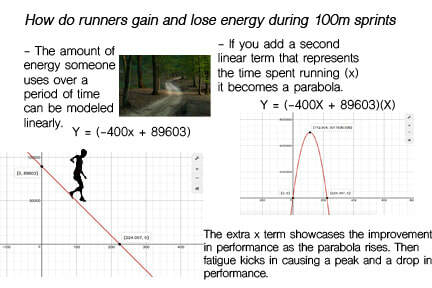 In my postcard I found the parabola of a runners energy over a certain amount of time. By combining two linear terms, one displaying the loss of energy over time (-400x+89603) and the other representing improvement over time (x), I got a parabola showcasing the gaining and loss of energy as a runner got warmed up and then fatigued. Overall I was very excited to do this project. I had recently learned about quadratics in another class and I wanted to see how I could apply this math to the real world. I knew many people would choose to find the parabolas of objects so I wanted to take a more statistical and data related approach. This way I could showcase a different type of use for quadratics and I could also challenge myself by trying to make a formula that would represent what I wanted it to represent. If I had more time to continue with this project I would have made the equations a bit more complex and used the data that I collected to formulate a more meaningful solution.